Posted January 18th, 2019 by Mobile Music School & filed under Benefits of Music Education, Educational - How to Guides. Performing as a music ensemble in front of an audience can sometimes be daunting. That’s why our music tutors encourage confidence, self-esteem and team-work in each music programme we deliver. As we learned in part 3, practice makes perfect. Here are a group of our recorder students performing proudly together, some of which had no musical experience at the start of the year! As we come to the end of our Recorder in the Classroom series, we can see the all the students’ hard work throughout the year paying off. This classroom performance is a practice run for the school’s end-of-year concert. The students’ ability to perform proudly together as a music ensemble shows how much they have progressed as a team, as well as individual musicians. Students are taught how to stand on stage, read music notation, focus and concentrate, and how to handle any slip-ups when they’re on stage for their big performance. 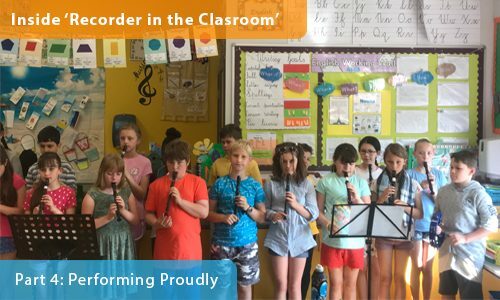 Inside ‘Recorder in the Classroom’ – Part 4: Performing Proudly coming next week!